The Greatest Hits – Volume 2: 20 More Good Vibrations is a 1999 single disc compilation by The Beach Boys and released through Capitol Records. It was released as the companion piece to The Greatest Hits – Volume 1: 20 Good Vibrations on the same day. This CD basically mops up some of the early classics that were left behind on the first volume, such as "In My Room" and "Don't Worry Baby", but continues on to cover their commercially lean but artistically valid 1967–1970 period, going from "Heroes and Villains" to the Al Jardine-produced "Cottonfields", a European hit in the summer of 1970. As on its earlier volume, the production credits on this album have been revised. Although originally credited to The Beach Boys, "Heroes and Villains", "Wild Honey", "Darlin'" and "Friends" are now credited as produced by Brian Wilson. 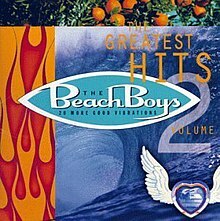 Released in September 1999, The Greatest Hits – Volume 2: 20 More Good Vibrations charted at number 192 U.S. in March 2000 after a Beach Boys ABC-TV movie was transmitted. All songs by Brian Wilson and Mike Love, except where noted. All tracks are mono single mixes, except where noted. This page was last edited on 29 October 2018, at 11:42 (UTC).